Here is a card I just created last night. Once again I wanted to use my own personal stamps and just have fun with a sketch. I did this card for Sweet Sketch Wednesday . I had so much fun coloring this Bugaboo stamp (they are having a great sale right now...50% off everything!!) I colored him with copics (used all C's) I also put glossy accents on the balloon and fun flock on his tummy and feet. I added balloon brads and regular brads. Happy Birthday is punched with SU oval punch and popdotted! Tonight I have to go grocery shopping..yuck I hate doing it but I have put it off long enough...I have nothing to cook for dinners right now LOL. I cannot believe it is July already...tomorrow is Brents birthday! That is just the cutest elephant and fantastic card! Hi Ashley, this is such a fun image and you have colored him up so cute. Great shading on this little guy! It sounds like you have a busy day ahead of you! Happy Birthday to the hubby!! And I am right there with you on the grocery shopping....hate going myself! Have a wonderful day! Oh Ashley I love how you colored up that cute bugaboo birthday image. . It all just so cute. Thanks for playing along @SSW!!! Wow! What a cute card! You really colored the image well! I love the balloon brads! Those are so cute! Thanks for playing! How cute is this card? Love your image and those balloon brads are so so cool love the bright colours. Thanks for playing along at SSW. AWWW Ashley this is soooo sweet, what a darling bday card! Sooooo adorable!!!! Love the colors, so bright and fun!!! Thanks for playing along at the SSW!! Hi Ashley, Ooooh this is too cute!!! Love how you colored him up and made his tummy fuzzy!! Thanks for playing with us at SSW, great take on the sketch hun!!! Cute take on the sketch! Happy birthday to your hubby. Thanks for playing along with us at SSW. Love this Bugaboo image and I especially love what you did to him...Love that glossy accents and the fun flock on his tummy and feet. How clever! Thanks for playing at SSW! I love this image too! Love all your shading and the glossy bits are a wonderful addition. Thanks so much for playing at SSW. Thanks so much for joining us at Sweet Sketch Wednesday. Great colouring and colour choices! Love the image! Thanks for playing at SSW! Im Ashley. 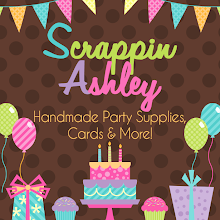 I am known as Scrappin Ashley or Scrappinash on my Etsy site. I love creating party supplies, cards, tags, banners and more to help make parties perfect! Please let me know if I can help create your perfect party! Text and pictures © Ashley Scheffler; All rights reserved. The content in this blog may not be copied or used without written permission from myself. All photos are for personal use only and may not be copied for submission to contests, magazines, or any other use. All of my posts are my own thoughts and opinions. Please do not take anything without asking me first! Thanks so much!